Home All VR + Baseball + Summer = America! VR + Baseball + Summer = America! As perhaps one of the rare few who never desired to play past tee-ball, yet still developed a love for our national pastime, I’ve sometimes wondered what it feels like to launch a baseball 400 feet off a bat. 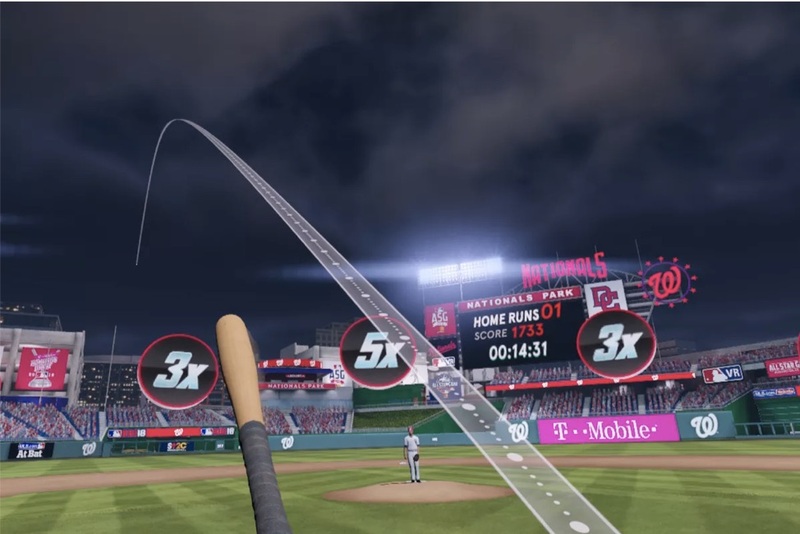 MLB Home Run Derby VR attempts to both capture this feeling as well as simulate the spectacle that is MLB’s annual Home Run Derby, which takes place during All-Star Week, by allowing anyone to hit homers from the comfort of their own homes. The real life Home Run Derby is unique in that it does not represent the parameters of actual baseball. Pitches are tossed straight down the middle at short distances and reasonable speeds, giving the batter ample time to load up and crush it into the stands. It is a showcase for the remarkable strength and skill that players don’t often get to showcase in an actual game. Fans watch in awe as they witness balls being sent to places they’ve never seen, and the atmosphere becomes electric if a player starts getting on a roll or if he is from the hometown team. MLB Home Run Derby VR captures the spirit of the competition. The density of fans in the stadium seemed appropriate and the noise they produced along with the backdrop of the PA announcer narrating each swing made it feel like a spectacle. There are three stadiums to choose from: Nationals Park, the site of this year’s All-Star festivities, Cleveland’s Progressive Field and Miami’s Marlins Park. Each stadium, at least from the perspective of the batter’s box, is well captured and includes major attractions like the Marlins’ ornate home run sculpture in center field, but you won’t find the painstaking level of detail that you would in Sony’s MLB The Show franchise. However, it was neat to be able to feel present in the batter’s box and be surrounded by a near 1:1 recreation of each ballpark, giving fans a sense of what real players see when they’re up to bat. 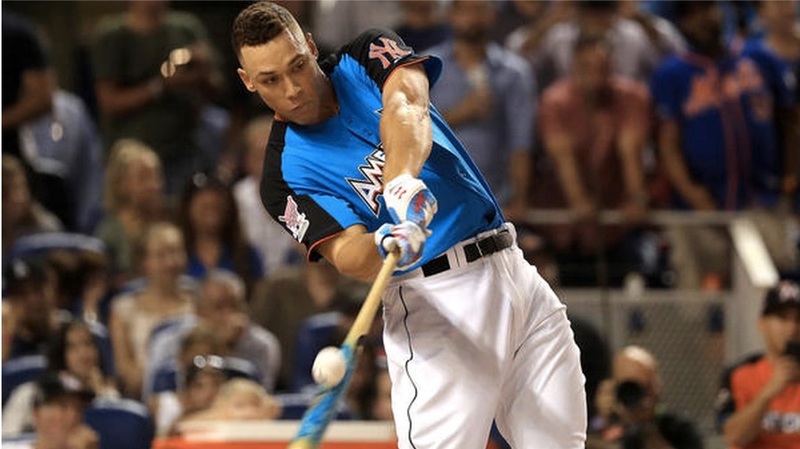 New York Yankees right fielder Aaron Judge won last year’s edition of the MLB Home Run Derby. As for the gameplay, the feedback provided by the HTC Vive controller I used as my bat felt somewhat realistic. The Vive also benefits from having longer controllers than other VR platforms, which might make it the ideal headset for the game. It feels somewhat satisfying to grip the controller and practice the form of your swing like real players, even if you’re like me and have absolutely no idea what you’re doing. Even so, the game does a respectable job of simulating swinging a bat by accounting for its angle, power and direction, and I experienced numerous outcomes that seemed consistent with how I was moving the controller. You have to swing hard to be able to hit home runs, but the game also feels forgiving enough that you can make contact no matter your skill or coordination level, at least on the game’s normal difficulty. The derby itself is the game’s only mode. You’re given one minute and 30 seconds to hit as many home runs as you can, and then you can submit your scores to leaderboards. The game succeeds at what it sets out to do, and its bare bones framework wouldn’t be problematic except for the fact that one major issue exists: its price tag. At $19.99, this game is severely overpriced. If anything, in my opinion, it should release for free as part of the All-Star Weekend experience, or at the most cost $4.99. But its current price is a disgrace to VR games considering that there are so many more high quality, deep experiences available for the same price or less. Baseball enthusiasts might buy this game regardless, but neutrals or casual observers of the game should be aware that they are purchasing nothing more than a mini game that provides no variety besides its three different stadiums. It’s fun to play nonetheless, especially if you’re a baseball fan who has always wondered what it’s like to be on the field. But potential exists for the experience to become dull very quickly, and in that moment you might realize that you’re short $20 and could’ve spent it on something more meaningful. Visuals: 2.5/5 – They won’t blow you away, but they do a decent job of making you feel like you’re in a real major league stadium. Playability: 3/5 – Swinging the bat feels fun, yet forgiving. And the fact that the ball reacts somewhat realistically to your swing motion adds depth to the experience. User Interface: 3/5 – Simple and straightforward, there’s nothing here that will add to or detract from your experience. Replay Value: 2/5 – Unless you wish to really hone your skills in an effort to make it to the majors, there’s little reason to revisit the game once you’ve played a few rounds. Some might not be willing to take the plunge and buy the game in the first place.